Understand your pain and learn how you can take control over your life again. Learn more in our book review of “Managing pain before it manages you” by author and pain expert Margaret A. Caudill. No medication can reduce chronic pain to zero. So, how can you cope with chronic pain…without the risk of addiction? We’ve found a book that can help. We invite you to continue reading this review to see what topics are covered by “Managing Pain Before It Manages You” and how they can significantly improve the way you view pain. At the end, we invite you to post your questions and comments about getting rid of pain without risking addiction in the designated section. We try to respond personally and promptly to all legitimate inquiries. At the very beginning of this review, I’d like to get one thing out of the way: “Managing Pain Before It Manages You” by Margaret A. Caudill, MD, PhD, MPH, is NOT a book that presents a program which promises a ‘magic cure’ for pain, or a program that will make your life pain-free. However, you can expect to get a better understanding of how your mind and body interact to manage pain, learn pain management skills by doing the suggested exercises, develop a better mental outlook on life, and thus improve your quality of life. 1. How to accept ownership of your pain. 2. Determine your problems that occur as a result of the pain. 3. Reassess your goals according to the realizations you make in this process. One strategy for gaining control over your pain is to keep a pain diary. Each of us has a different tolerance for pain. The book features a pain-diary and easily-comprehensible instructions for use. It is important to start keeping track of your pain levels and how they vary depending on changes in your activities, tension, climate, sleep, etc. It can help you start to distinguish your physical sensations and your emotional experiences of pain. You see, the sensation of physical pain and emotional responses to it are very different. In the second chapter of the book, you will learn more about where pain comes from and how it works. The author then goes deeper into explaining acute pain and chronic pain, but also shares a story that is common to many individuals who suffer from chronic pain. By understanding the origin of pain, as well as the role of sensory nerves, the spinal cord, the brain, genes, and environmental impacts can help you on a cognitive level. Nothing is more scary than the unknown, and nothing is more frustrating than an issue you cannot do anything to fix. However, this is not the case with pain; by changing the way you perceive it and approach it mentally and emotionally can make a big difference. In this part of the book you will also find many other useful actions you can take to reduce pain. Chapter 2 also presents multiple reviews and supporting evidence on the benefit from various drug therapies, including marijuana and opioid painkillers. To help you cope with stress as one of the primary symptoms from pain, as well as with other stress-related symptoms, this book offers ten (10) relaxation techniques. In fact, you are provided with a step-by-step instructions for relaxation techniques which you are recommended to practice for 20 minutes 1-2 times a day. In the previous chapter focused on the normal and expected responses to pain, such as stopping all movement, social interaction withdrawal, ignoring sensations, pushing physical movement/exercises by denying the problem, etc. These thoughts, attitudes and behaviors need to change because you cannot let pain consume you, but you can’t ignore it either. In this chapter, you are offered to learn the power of your mind, and how your thoughts are associated with regaining control over pain. You will understand that the way we think affects the way we experience pain, and one way to change our thoughts is through self-talk. The author will help you wok on changing your thinking patterns using another guide with techniques you can start practising by yourself. What else will I have a chance to learn? You will learn to identify any problematic attitudes you may have regarding your response to pain, and how you can adopt new, healthy attitudes. You will have a chance to explore some basic nutritional guidelines. You will learn how food can help you manage pain, through growing your understanding of ingredients and food additives which are linked to increases in pain. You will also get to grow your knowledge on how to better communicate with health care professionals. Being able to explain what you are feeling will help your doctor better understand your needs and act accordingly. You will learn how to become an effective problem-solver through setting goals, identifying barriers to accomplishing these goals, and identifying the steps needed for a goal to be achieved. 1. Pain is an individual experience and there is no one-size-fits all treatment and no simple way for dealing with it due to it’s complexity. 2. No medication can reduce chronic pain to zero. Even if it works at the beginning, as tolerance grows, the pain-relieving effects diminish. That’s why it is necessary to use your mind, body, and spirit to reduce pain suffering. More here on how to recognize symptoms of pain killer abuse or addiction. 3. People who live with chronic pain can change how their condition affects their life by changing their attitude towards and expanding their awareness and knowledge of pain. 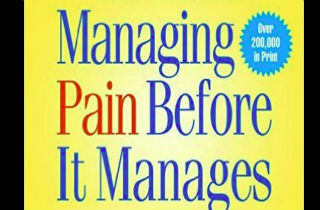 This book describes a path to chronic pain management to those who suffer. Moreover, it get readers more familiar with all background aspects of pain AND offers positive and effective techniques for self-help and improvement. The reason we believe it can help you is because it doesn’t make false promises for a complete pain-relief, but allows you to reduce your suffering and regain control over your life again. I’d say it’s an ultimate guide to helping people get control of pain, and to avoid the life changing aspect of pain pill addiction. The more you know, the more you can apply! About the Author: Margaret A. Caudill, MD, PhD, [Margaret A. Caudill, MD, PhD links to: http://www.oprah.com/health/Meet-LLuminari-Expert-Dr-Margaret-A-Caudill-Slosberg] is a board-certified internist and a Diplomate of Pain Medicine. She is Adjunct Associate Professor of Anesthesiology at Dartmouth Medical School and has served as Co-Director of the Arnold Pain Center, Beth Israel Deaconess Medical Center, Boston, Massachusetts, and as Co-Director of the Department of Pain Medicine, Dartmouth Hitchcock, Manchester, New Hampshire. Dr. Caudill has long been interested in empowering people with chronic illness through medical treatments that bring mind and body together. She has researched and written extensively on mind/body medicine and lectured internationally on the importance of the biopsychosocial treatment model of pain. I read Healing Back Pain from Dr. Sarno. The Mind Body Connection makes a lot of sense to me. In fact, I was about to get surgery 4 years ago and I read his book and I cancelled surgery for my back and ran a marathon 3 months later. I’ve been living life fully since then but now it’s back and much worse. I’m taking so many meds and I’m trying so hard to not have surgery. But I can’t keep taking all these meds… Is this book something that could lower my 10/10 pain? Throbbing acute pain down both legs and sciatica. It’s ruining my life. Hi Robert. This isn’t a book that presents program that will make your life pain-free. But, you can learn pain management skills, get a better understanding of how your mind and body interact to manage pain, and these thing may improve your quality of life. Why do people have different pain tolerances? Florida pain clinics – Too much or too little regulation?